I was actually surprised and happy to see that he’s just good at his job. He’s not God’s gift to doctors, he’s just competent. That makes the character make a bit more sense, within the confines of the premise. The abrasive head guy needs a bunch of people to stay late (on Christmas Eve) and he picks Doogie among others. There is a focus on a patient who’s brought in with no ID who’s raving, seems completely manic and seems to think he’s various famous and/or historical figures. 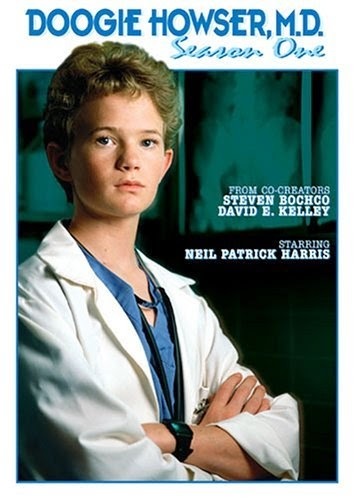 Doogie’s annoying friend Vinnie, escapee from a more standard teen sitcom, shows up at the hospital and pressures Doogie into somehow getting out of work to go to his girlfriend’s party. And I guess if you really want to be convincingly sick, you could do worse than actually be a doctor, although most of the techniques are standard kid-fakes-an-illness stuff. So he gets sent home, and there’s a short subplot about his dad struggling with Christmas lights, and then he’s off to the party. However, he feels terrible about skipping out on his coworkers, and after getting a clue from something Wanda (the girlfriend) says, he’s back at work in time to wear a silly outfit and hand out gifts. There was a moment I really liked here where all the doctors and nurses are getting ready for this gift distribution in pediatrics, when there’s an alarm and they’re all called down to the ER to deal with incoming accident victims from a traffic pile-up. Whether or not it’s realistic that doctors would be participating in the gift delivery, the response to switching gears felt grounded, and seeing them dealing with emergencies still in the silly outfits felt natural, not humorous. Of course, it also gives us our requisite heartwaming moments, when the head guy saves a kid’s like while dressed as Santa. The manic guy from earlier is found and helped, now that they know what’s wrong with him, and then Doogie finally goes home for some rest. Wanda and Vinnie drop by to wish him a happy holiday, Doogie writes banal crap in his diary, and we’re done. Overall I was surprised at how decent this show was. The episode was enjoyable, and the gentle pace worked. The diary at then end nearly undermined the whole thing, though. Up to that point, we had both commented on the subtlety of the characterization. The diary bit, though, made us question whether the people writing the episode had any idea that their audience might be older than 6.